Scott Serpas is looking to expand his mini restaurant empire into Brookhaven. Scott Serpas, a Brookhaven resident, plans to create a "neighborhood-centric casual eatery" later this year in the heart of Brookhaven. Serpas' new restaurant is planned for a white house on Caldwell Drive, basically right behind Savi Urban Market. The restaurant would have seating for approximately 70 patrons with seemingly limited parking. While the plan and parking for the restaurant are still very fluid, I'm told that Serpas will offer valet only and hopes to have an agreement secured for parking in the near future. 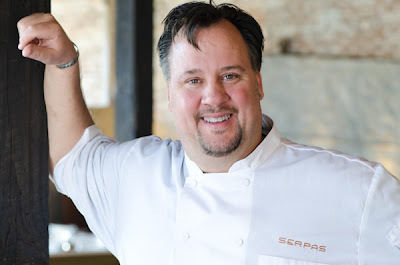 Serpas, a Louisiana native, opened his namesake restaurant, Serpas true food, in early 2009 in the Old Fourth Ward, after spending time at NAVA and helming the kitchen at Two Urban Licks from its inception in 2004 until 2007. Serpas True Food features a Louisiana influenced menu and I'm told the new restaurant will offer a broader menu with Gulf Coast area cuisine. The menu is still being developed, but the plan is for the restaurant to be more casual than Serpas' first eatery. I was first informed of Serpas's intentions earlier last month, but as the deal was only in the early stages of negotiations, I opted not to publish. Last night, the city of Brookhaven met to discuss a variance request related to the height of the current structure. The structure is already zoned commercial, and despite having their variance denied, I'm told that Serpas' still plans to consider the project. Obviously, some changes to the floor plan and buildout will have to be made, but I'm told a contingency plan was in the works even before the variance meeting, however a lease has not yet been secured. If all goes well, perhaps the restaurant could open by late summer or early fall. Next door to Serpas is Pizza Rock, a new pizzeria that has been "coming soon" for months, and should be opening in a few weeks. The aforementioned Savi Urban Market, on Dresden Road in front of both restaurants, is hoping to tear down their current single story structure, and erect a two story structure closer to the road. Savi has renderings of their plans in the business and available for view. What are your thoughts on Serpas' plans for his next eatery? Are you in favor of the changes Savi wants to make? What is your favorite Brookhaven area restaurant? i am all in favor of building up brookhaven's business and am thrilled for a CASUAL eatery. i do not feel that other upscale restaurants are needed. i do continue to lament the loss of Library Coffee Co. we do not need more overpriced sushi but a local, casual, comfortable coffeehouse and sandwich shop ... YES. While I think an additional restaurant in the area is a good idea, I am deeply concerned about the proposed location and parking situation. Although the building is zoned for commercial use, it is very much in the heart of a resedential area. The streets are narrow, poorly lit, and there are no sidewalks. Where will the patrons park? As a resident of Green Meadows, I'm worried that overflow parking will spill over to our narrow street, create congestion, and potentially unsafe conditions as there already issues with Caldwell and the traffic/valets from Kaleidoscope. Cars waiting for valet back up the intersection, turn around in the middle of the road, and valets dart across busy Caldwell without looking for oncoming cars. If the designs are properly planned and take into account the limitations of the area, that's one thing... we're all for SMART growth and planning. This is going to be a traffic mess in the evenings. Where does he plan on parking cars for 70+ customers + staff when the plans only show 10 parking spaces. Oh boy - a big traffic mess. I guess it's outside the purview of the Atlanta mind to consider parking in the parking deck that's just a couple yards away, or the parking lot, or the street-front parking, or one of the many side streets, and (GASP) walking! Oh - and to the guy who is all about "smart growth and planning" - that line might work amongst your little cadre of suburban transplants that think Brookhaven is a poster child for "smart growth & planning". However, for those who actually know what smart growth and planning is, it doesn't fly. Brookhaven is the antithesis of smart growth and planning. Building monstrosities like TOWN, having one little strip of retail amongst a sea of single-family homes, and separating yourself from the city that provides virtually most of your residents with their employment, rather than integrating yourself into it are just a handful of reasons. I can think of several opportunities in Tucker to open a good quality restaurant with plenty of parking and patronage. I say we consider a place like Follies to be opened in this location. This type of urban influence is sure to bode well with the other residents and business's. Just imagine how many rap songs our fair coty of Brookhaven could be referenced in and with Marta being so close, we can all assured that only finest clientel will be able to frequent such an establishment. Bring on Molly i say!!! Another 2013 post? (sigh)... Ratsratsrats.